Jerry Mitchell drove his pick-up truck through the winding streets of the Ruskin neighborhoods. Sunlight rippled through tall old trees. Birds sang. A few kids played in their yards. Occasionally, a neighbor out walking would recognize Mitchell’s truck and give him a friendly wave. Then, turning a corner, Mitchell’s face fell as a boarded-up house came into view. Unruly, waist-high grass covered the yard. The roof sagged. Broken windows gaped. As the volunteer community liaison officer for Ruskin Heights, Ruskin Hills and Ruskin Village, Mitchell and his truck are familiar sights in the Ruskin neighborhoods. He is often a bridge between the people of the neighborhoods and government officials, listening to problems and finding solutions. The number one problem Mitchell is tackling these days is the slew of abandoned and foreclosed properties in the Ruskin neighborhoods. “This zip code is the second-highest in the state, in terms of foreclosures,” Mitchell said. “We’ve been hit hard here in Ruskin. There are about 125 houses in the Ruskin neighborhood that are abandoned, or have been foreclosed on by the banks,” Mitchell said, pointing at a house with broken windows, moldy siding, and “dangerous building” boarding right across the street from Symington Elementary School. Indeed, the otherwise pleasant drive through the neighborhoods was marred by dozens of crumbling, empty, dangerous houses on lots covered with rampant overgrowth. “I’m the one out on the front line,” he said as he got out of his truck and walked behind a boarded-up house. Cleaning up his neighborhood is a job he takes seriously, and a new federal tool is helping Mitchell and others in Kansas City battle the blight caused by abandoned homes. The federal Neighborhood Stabilization program is in effect all across the nation, and Kansas City has some $7.1 million in program funds this year to purchase and rehabilitate foreclosed and abandoned properties. The first step in getting a house into the program is to identify the foreclosed property and file a nuisance suit against the owner—which is usually a bank or mortgage company, but can sometimes be an individual who has moved away, but still owns the property. Some homes, for example, are being used as storage facilities for owners as far away as Denver or California. To qualify as being a nuisance the house has to have at least two years of back property taxes owed against it, and at least a two-year history of code violations. Ruskin is in the process of identifying these dangerous homes and filing suit against the owners. So far, the Ruskin neighborhood associations have filed suit on about 20 properties. But not just any houses. Mitchell said some residents think there is a “forced” sale involved with the program, similar to the use of eminent domain. But that’s a misconception, he said. The Neighborhood Stabilization program does not confer the power to “take” any property – only to use federal money to buy it, rehab it, and help a new owner buy it. Some residents of the Ruskin neighborhoods said they had concerns about the program, including one homeowner who worried his house was on what he called “Jerry’s hit list” (it isn’t). One woman said she was worried that some elderly people don’t have the money to bring their houses up to code. But no one wanted to go on record as being opposed to the program. Mitchell said Ruskin isn’t “targeting” minor problems or people who truly can’t afford to fix code violations, but only major nuisance properties. He acknowledged that often, what constitutes a “nuisance” is in the eye of the beholder. What he and other Ruskin residents are most concerned about, he said, are health and safety issues. He said banks and mortgage company officials usually don’t ever see the properties they foreclose on, and getting them to maintain a foreclosed house can be a nightmare. He’s not the only person who thinks so. 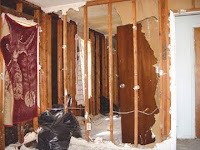 “Every foreclosed house negatively impacts the property values of everyone else in the neighborhood,” said Mark Stahslworth, president and CEO of Neighborhood Housing Services of Kansas City, a not-for-profit organization that specializes in rehabbing old houses. NHS is one of several not-for-profits, including Habitat for Humanity and Swope Homebuilders, using the Neighborhood Stabilization funds to revitalize Kansas City neighborhoods. Once the homes are fixed up, they’ll be sold by the not-for-profits as owner-occupied homes – not as investment properties for what Mitchell called “Section 8 landlords” or as rental properties. Mitchell said owner-occupied homes are simply better for the neighborhood than rental properties. He said he has nothing against renters, and that there are plenty of stable, attractive rental properties in the Ruskin area with renters who are “good people.” That being said, Mitchell said he believes many renters don’t have the same vested interest in keeping their neighborhoods nice as homeowners do. He said they’re often the victims of greedy landlords, and pay far more in monthly rent than they would on a house payment. The Neighborhood Stabilization program has a number of incentives to help get people into their own home. The program even pays 20 percent of the sale price for the buyer, including down payment and closing costs. Stahlsworth urged potential buyers to seriously consider the program. No one really “profits” from the sale of these homes, Stahlsworth said. The money goes back into the program to purchase and rehab more homes. This round of federal money must be spent by September of this year, and Stahlsworth said they’ll have no problem spending it. What “profit” there is goes back into the program, and that money can be spent after the deadline. But the funds are supposed to be paid back to the federal government, without interest, in 2013. Back in the Ruskin neighborhoods, the homes associations have filed suit so far on houses that range from those with un-mowed grass to those that are literally falling apart. During Mitchell’s morning drive through the neighborhood, he pointed out houses with broken windows, sagging or broken gutters, peeling paint, holey roofs and rotting wood. Mitchell even got out of his truck a few times and pointed out houses with no interior walls, exposed electrical wiring, significant water and mold damage, back yards strewn with filth and debris, and gaping holes in walls and rooftops. Dead bugs and animal feces were common sights through the windows of some properties. Most have gas lines to the house turned off, are missing outdoor air conditioning units, and have been completely stripped of copper wiring by thieves. “This is just awful,” Mitchell said, shaking his head sadly as he gazed at a hard-hit home on Longview Road. But his spirits improved as he drove down Palmer Street. There, a yard sign emblazoned with the Neighborhood Stabilization logo proclaimed that a little, green, ranch-style home was being rehabbed as part of the federal program. A contractor who was doing concrete work on the side of the house smiled and waved at Mitchell as he drove by.